Berkowitz, MatthewGolinkin, David and Kulp, JoshuaLukinsky, Joseph SanderEven-Chen, AlexanderAbramson, Shraga and Mirsky, AaronAssaf, Simcha and Glick, ShmuelArad, MotiBonfil, RobertBenovitz, MosheBrody, Hayim and Pagis, DanBrody, Hayim and Schirmann, JefimGoldberg, AbrahamGolinkin, DavidGinzberg, Louis and Golinkin, DavidGinzberg, LouisGlick, ShmuelDavid, AbrahamDavidson, IsraelDavis, MosheDanzig, NeilHoltz, AvrahamHyman, HillelHirshman, MarcHalivni, DavidVisotzky, Burton I.Wald, Stephen G.Vachman, GilaZulay, MenahemIakerson, ShimonCohen, Stuart and Susser, BernardKatz, MenachemLevias, CasparLevine, Lee I.Lieberman, SaulMaman, AharonMandelbaum, BernardMargaliot, MordechaiMarx, Alexander and Abramson, ShragaAssis, MosheFinkelstein, LouisFalk, Ze'evFriedman, Shamma (ed. 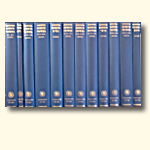 )Friedman, ShammaFrancus, IsraelZucker, MosheKosovsky, Hayim YehoshuaKadari, TamarKosovsky, MosheRabinowitz, Zeev Wolf and Melamed, Ezra ZionRabinowitz, Mayer E.Rovner, JayRosenthal, E. S.Rosenak, MichaelRoth, JoelRoth, Schmelzer, Francus (eds. )Ramon, EinatSchechter, Solomon and Kister, MenahemScholem, GershomSchmelzer, Menahem H.Shinan, AvigdorSpiegel, ShalomTabory J. and Atzmon A. 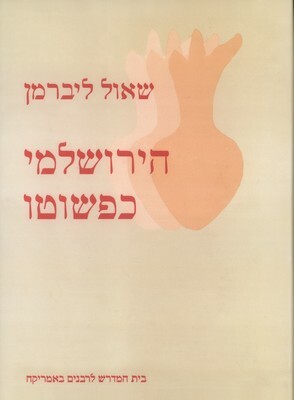 A commentary based on manuscripts of the Yerushalmi and works of the Rishonim and Midrashim in Mss. and rare editions. Tractates Shabbath, 'Erubin, Pesahim. Third edition. 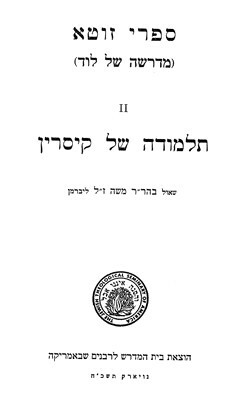 Addenda et Corrigenda to Hayerushalmi Kiphshuto of R. Saul Lieberman za''l .Edited and Supplemented by Menachem Katz. 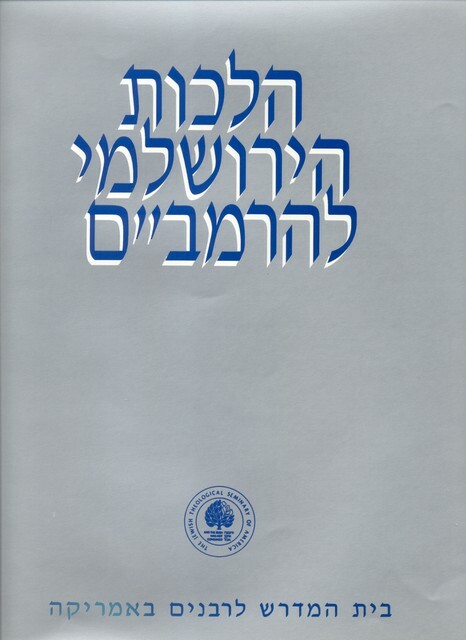 Hilkhoth Ha-Yerushalmi (The Laws of the Palestinian Talmud) of Rabbi Moses Ben Maimon with Introduction, Commentary and Notes. Two works by Saul Lieberman: Siphre Zutta (The Midrash of Lydda) and The Talmud of Caesarea. 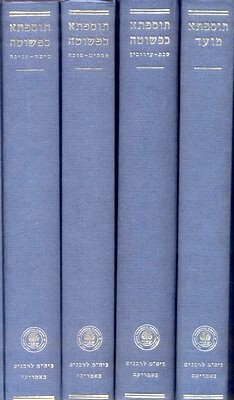 Four Orders of the Tosefta according to Codex Vienna, with variants, references to parallel passages in Talmudic literature and a brief commentary, and a comprehensive commentary on the Tosefta entitled "Tosefta Ki-Fshutah". The Tosefta according to Codex Vienna, with variants from Codices Erfurt, London, Genizah Mss. and Editio Princeps (Venice 1521) together with references to parallel passages in Talmudic literature and a brief commentary. Third printing, New York and Jerusalem 2002. The Tosefta according to Codex Vienna, with variants from Codices Erfurt, Genizah Mss. and Editio Princeps (Venice 1521) together with references to parallel passages in Talmudic literature and a brief commentary. Third printing New York and Jerusalem 2007. The Tosefta according to Codex Vienna, with variants from codices Erfurt, Genizah Mss. and Editio Princeps (Venice 1521), together with references to parallel passages in Talmudic literature and a brief commentary. The Tosefta according to Codex Vienna, with variants from Codex Erfurt, Ms. Schocken and Editio Princeps (Venice 1521) together with references to parallel passages in Talmudic literature and a brief commentary.